I have a Nikon D90 DLSR and and from time to time I want to convert color photographs these into B&W photos. I use the open-source and completely free GIMP to edit the pictures and do B&W conversion. Using the built-in grey scale conversion often doesn’t come out to nicely, so I was wondering how to emulated the classic B&W films using the channel mixer in GIMP. I turns out that Petteri Sulonen on his blog www.prime-junta.net had done just that. On the left I am showing the Channel Mixer window in Gimp to converting a color photography using the Ilford XP2 Super channel settings. Below is list of his findings (I have done this mainly to have a online copy in case his blog goes offline). 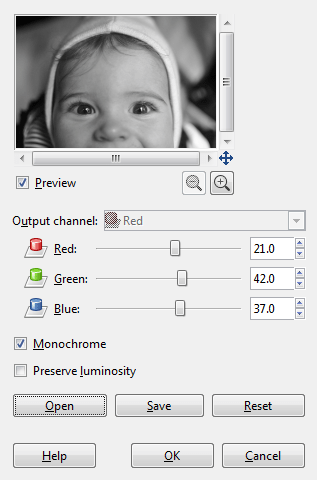 My only small contribution is a ZIP file with all the profiles saved as GIMP channel mixer settings files, so the profiles can easily be loadd: GIMP-BW-film-Channel-Mixer.zip 6KB. hm .. I hope you know that, when doing B/W photography, one usually uses the highest available ASA aka ISO film. Back in 2002/2003, when I still did that excessively, I used at least ASA 400 films, most times 800s thou. Anything below ASA 200 is just good for simple holiday pictures. For one I haven’t discussed film speeds or their digital equivalents in this post and secondly I think you have misunderstood the concept of film speeds. So in summary I use the lowest ISO number possible in a given situation to achieve the least grainy/noisy picture I can get. If I later want more grains I can add the digitally.